Earth’s atmosphere is leaking. 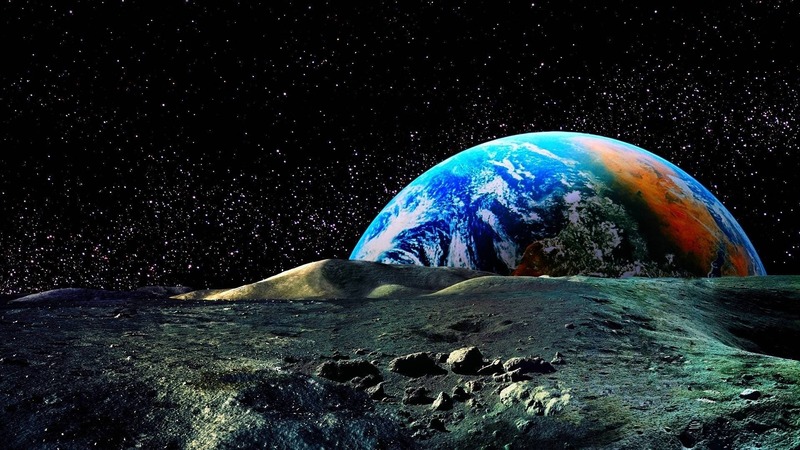 Every day, around 90 tons of material escapes from our planet’s upper atmosphere and streams out into space. Although missions such as ESA’s Cluster fleet have long been investigating this leakage, there are still many open questions. How and why is Earth losing its atmosphere – and how is this relevant in our hunt for life elsewhere in the Universe? Given the expanse of our atmosphere, 90 tons per day amounts to a small leak. Earth’s atmosphere weighs in at around five quadrillion (5 × 1015) tonnes, so we are in no danger of running out any time soon. However, understanding Earth’s atmosphere, and how it escapes to space, is key to understanding the atmospheres of other planets, and could be crucial in our hunt for habitable planets and extraterrestrial life. We have been exploring Earth’s magnetic environment for years using satellites such as ESA’s Cluster mission, a fleet of four spacecraft launched in 2000. Cluster has been continuously observing the magnetic interactions between the Sun and Earth for over a decade and half; this longevity, combined with its multi-spacecraft capabilities and unique orbit, have made it a key player in understanding both Earth’s leaking atmosphere and how our planet interacts with the surrounding Solar System. Earth’s magnetic field is complex; it extends from the interior of our planet out into space, exerting its influence over a region of space dubbed the magnetosphere. 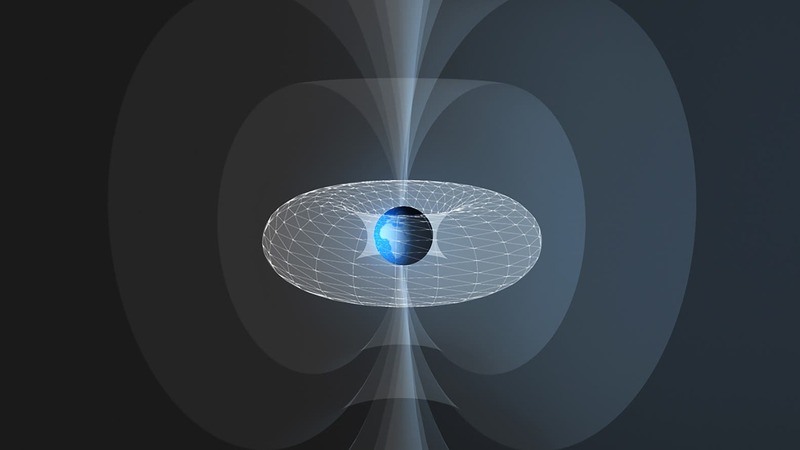 The magnetosphere – and its inner region (the plasmasphere), a doughnut-shaped portion sitting atop our atmosphere, which co-rotates with Earth and extends to an average distance of 20 000 km – is flooded with charged particles and ions that are trapped, bouncing back and forth along field lines. At its outer Sunward edge the magnetosphere meets the solar wind, a continuous stream of charged particles – mostly protons and electrons – flowing from the Sun. Here, our magnetic field acts like a shield, deflecting and rerouting the incoming wind as a rock would obstruct a stream of water. This analogy can be continued for the side of Earth further from the Sun – particles within the solar wind are sculpted around our planet and slowly come back together, forming an elongated tube (named the magnetotail), which contains trapped sheets of plasma and interacting field lines. However, our magnetosphere shield does have its weaknesses; at Earth’s poles the field lines are open, like those of a standard bar magnet (these locations are named the polar cusps). Here, solar wind particles can head inwards towards Earth, filling up the magnetosphere with energetic particles. Just as particles can head inwards down these open polar lines, particles can also head outwards. 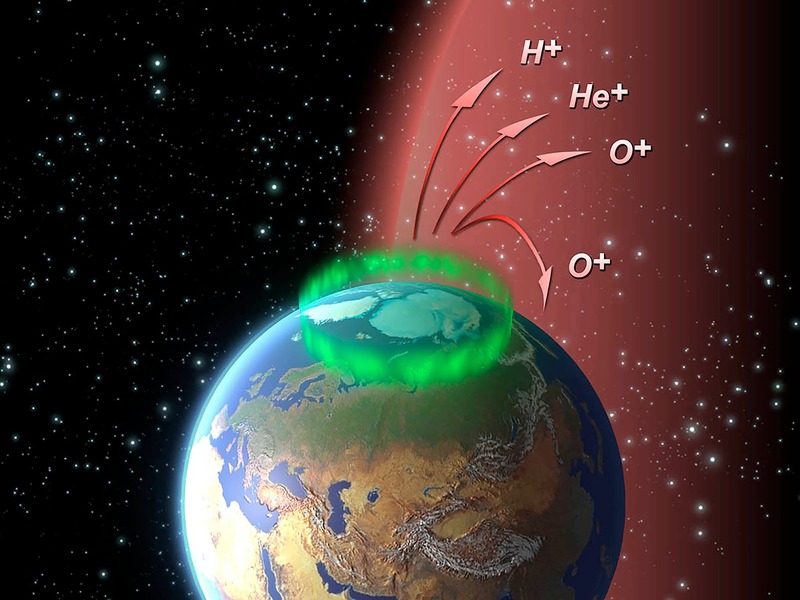 Ions from Earth’s upper atmosphere – the ionosphere, which extends to roughly 1000 km above the Earth – also flood out to fill up this region of space. Although missions such as Cluster have discovered much, the processes involved remain unclear. Initially, scientists believed Earth’s magnetic environment to be filled purely with particles of solar origin. However, as early as the 1990s it was predicted that Earth’s atmosphere was leaking out into the plasmasphere – something that has since turned out to be true. Observations have shown sporadic, powerful columns of plasma, dubbed plumes, growing within the plasmasphere, traveling outwards to the edge of the magnetosphere and interacting with solar wind plasma entering the magnetosphere. More recent studies have unambiguously confirmed another source – Earth’s atmosphere is constantly leaking! Alongside the aforementioned plumes, a steady, continuous flow of material (comprising oxygen, hydrogen, and helium ions) leaves our planet’s plasmasphere from the polar regions, replenishing the plasma within the magnetosphere. Cluster found proof of this wind, and has quantified its strength for both overall (reported in a paper published in 2013) and for hydrogen ions in particular (reported in 2009). Overall, about 1 kg of material is escaping our atmosphere every second, amounting to almost 90 tonnes per day. Singling out just cold ions (light hydrogen ions, which require less energy to escape and thus possess a lower energy in the magnetosphere), the escape mass totals thousands of tonnes per year. Cold ions are important; many satellites – Cluster excluded – cannot detect them due to their low energies, but they form a significant part of the net matter loss from Earth, and may play a key role in shaping our magnetic environment. Solar storms and periods of heightened solar activity appear to speed up Earth’s atmospheric loss significantly, by more than a factor of three. However, key questions remain: How do ions escape, and where do they originate? What processes are at play, and which is dominant? One of the key escape processes is thought to be centrifugal acceleration, which speeds up ions at Earth’s poles as they cross the shape-shifting magnetic field lines there. These ions are shunted onto different drift trajectories, gain energy, and end up heading away from Earth into the magnetotail, where they interact with plasma and return to Earth at far higher speeds than they departed with – a kind of boomerang effect. Such high-energy particles can pose a threat to space-based technology, so understanding them is important. Cluster has explored this process multiple times during the past decade and a half – finding it to affect heavier ions such as oxygen more than lighter ones, and also detecting strong, high-speed beams of ions rocketing back to Earth from the magnetotail nearly 100 times over the course of three years. More recently, scientists have explored the process of magnetic reconnection, one of the most efficient physical processes by which the solar wind enters Earth’s magnetosphere and accelerates plasma. In this process, plasma interacts and exchanges energy with magnetic field lines; different lines reconfigure themselves, breaking, shifting around, and forging new connections by merging with other lines, releasing huge amounts of energy in the process. Here, the cold ions are thought to be important. We know that cold ions affect the magnetic reconnection process, for example slowing down the reconnection rate at the boundary where the solar wind meets the magnetosphere (the magnetopause), but we are still unsure of the mechanisms at play. Recently, scientists modelled and simulated Earth’s magnetic environment with a focus on structures known as plasmoids and flux ropes – cylinders, tubes, and loops of plasma that become tangled up with magnetic field lines. These arise when the magnetic reconnection process occurs in the magnetotail and ejects plasmoids both towards the outer tail and towards Earth. Cold ions may play a significant role in deciding the direction of the ejected plasmoid. These recent simulations showed a link between plasmoids heading towards Earth and heavy oxygen ions leaking out from the ionosphere – in other words, oxygen ions may reduce and quench the reconnection rates at certain points within the magnetotail that produce tailward trajectories, thus making it more favourable at other sites that instead send them Earthwards. These results agree with existing Cluster observations. Another recent Cluster study compared the two main atmospheric escape mechanisms Earth experiences – sporadic plumes emanating through the plasmasphere, and the steady leakage of Earth’s atmosphere from the ionosphere – to see how they might contribute to the population of cold ions residing at the dayside magnetopause (the magnetosphere-solar wind boundary nearest the Sun). Both escape processes appear to depend in different ways on the interplanetary magnetic field (IMF), the solar magnetic field that is carried out into the Solar System by the solar wind. This field moves through space in a spiralling pattern due to the rotation of the Sun, like water released from a lawn sprinkler. Depending on how the IMF is aligned, it can effectively cancel out part of Earth’s magnetic field at the magnetopause, linking up and merging with our field and allowing the solar wind to stream in. Plumes seem to occur when the IMF is oriented southward (anti-parallel to Earth’s magnetic field, thus acting as mentioned above). Conversely, leaking outflows from the ionosphere occur during northward-oriented IMF. Both processes occur more strongly when the solar wind is either denser or travelling faster (thus exerting a higher dynamic pressure). Learning more about our own atmosphere can tell us much about our planetary neighbors – we could potentially apply such research to any astrophysical object with both an atmosphere and a magnetic field. We know that planetary atmospheres play an essential role in rendering a planet habitable or lifeless, but there remain many open questions. Consider the diversity seen in the planets and moons of our Solar System, for example. In our small patch of the Universe we see extreme and opposite worlds: the smog-like carbon dioxide atmosphere of Venus, the much-depleted tenuous atmosphere of present-day Mars, the nitrogen-rich atmosphere of Saturn’s moon Titan, the essentially airless Jovian moon Callisto, the oxygen-bearing atmosphere of Earth. How do we know if these planets could support life, or whether they may once have done so? Mars, for example, is thought to have once had a thick, dense atmosphere that has been considerably stripped away over time. Although the Red Planet is unlikely to be habitable today, it may well have been so in the past. Cluster is a unique mission; it comprises four spacecraft – a format that NASA recently used for their Magnetospheric Multiscale (MMS) mission, launched in 2015 – which allow continuous study of Earth’s magnetic field and the solar wind from multiple locations and orientations. Cluster has been operating since 2000, and in that time has compiled a wealth of information about our magnetic environment across various periods of solar and terrestrial activity. “Additionally, Cluster’s orbit is truly unique amongst all current missions; the fleet is on a polar orbit, meaning they can explore our planet’s dynamic polar regions – specifically the cusps and polar caps – up close and in unprecedented detail,” added Escoubet. Cluster’s payload consists of state-of-the-art plasma instrumentation to measure electric and magnetic fields over wide frequency ranges, and key physical parameters characterising electrons and ions from energies of near 0 eV to a few MeV. The science operations are coordinated by the Joint Science Operations Centre (JSOC) at the Rutherford Appleton Laboratory, United Kingdom, and implemented by ESA’s European Space Operations Centre (ESOC), in Darmstadt, Germany.